Originally, SPECIMEN stamps were overprinted copies of new issues supplied to the Universal Postal Union (UPU) for distribution to member-countries for purposes of identification, for archives, and for distribution to postmasters. Later, many countries also distributed such overprinted stamps to government officials. Normally issued way in advance of the actual first day of issue, SPECIMEN stamps are normally sent to writers, editors and publishers for publicity purposes. Many countries also distribute them to those with standing orders of new issues, both collectors and dealers. Such stamps have no postal validity but are avidly sought by collectors since their quantities are always limited. Although there were SPECIMEN stamps for some early Republic issues printed by the American Bank Note Company between 1947 and 1957, they were not widely distributed, and are relatively unknown to collectors. In 1978, upon the request of Southern Stamp Service of England, the agent for the Philippine Bureau of Posts, SPECIMEN stamps were issued. 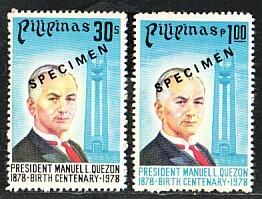 From the 1978 Quezon Birth Centenary to the 1979 Fight Drug Abuse issues, SPECIMEN stamps were issued. This practice was discontinued for some time because the main purpose for such issue had not been achieved, as almost always, they were distributed weeks or months after the stamps were put on sale. After some considerations, the issuance of SPECIMEN stamps resumed with the 1980 International Association of Universities issue. However, it was discontinued again starting the second quarter of 1989, with the last issue being the Fiesta Islands I. In between those issues, almost all issues, except overprints and surcharges, exist with the SPECIMEN overprints. The reason for this termination was that there were complaints of unequal distribution, and that there were many collectors and dealers who were getting them for free, just to sell them at high prices. In 1991, there were plans for the establishment of a Postal Museum and Philatelic Library, and a suggestion was made that SPECIMEN stamps should be printed so the Library can have a record of all stamps issued. Therefore, starting with the 1991 Philippine Bar Association issue, the printing of SPECIMEN stamps was resumed. At first, only two sheets of stamps and two souvenir sheets were printed, which all went to the Library. There was a plea from some collectors that more be printed. So, up to the last issue of 1997, the Gamecocks issue, almost all new issues came with the SPECIMEN overprints, except for re-issues and some overprinted souvenir sheets. All of the SPECIMEN stamps have the word "SPECIMEN" overprinted across the face of the stamps. They are not part of the printing order, but rather, additional quantities given free to the Bureau by the printers. There are many types of these SPECIMEN overprints which differ in sizes and fonts, which may be diagonally placed or horizontally positioned. There are also some that were hand- stamped only. SPECIMEN stamps of the 1978 up to the 1979 Philippine Birds issues, and all other foreign-printed stamps, have only the word "SPECIMEN" printed on them. Starting with the 1979 Association of Special Libraries up to the 1989 Fiesta Island I issue, all locally-printed SPECIMEN stamps and souvenir sheets have control numbers. Also, the face value of the stamps were obliterated by overprinting two bars over them. However, beginning with the 1991 Philippine Bar Association issue up to the 1997 Gamecocks issue, instead of two deleting bars, they are now drawn by hand causing differences in the length of the bars, different distances between bars, etc… The use of Control numbers was also abolished. Most of the "SPECIMEN" overprints were machine printed, except for most issues of 1982 and the Concert at the Park stamp of 1981, wherein violet handstamps were used! Starting with the Association of Special Libraries issue of 1979, all locally- printed "SPECIMEN" stamps and souvenir sheets have control numbers, from #0001 to #1000 (except for the Corals block of 4, which are not all in 4 digits). All these also have 2 deleting bars over the face values. "SPECIMEN" stamps should have been overprinted on the initial printing of all issues, if the printer and/or the Bureau of Posts had intended to release them ahead of or on the date of issue of the stamps. However, almost always, they were overprinted and delivered during the last stages of the printing, or together with the last delivery of the stamps. Therefore, many of our "SPECIMEN" stamps exist on different paper and/or perforation varieties, because by the time the printer was ready to overprint the "SPECIMEN", the original printing was no longer available. In fact, there are some "SPECIMEN" stamps that exist on more than one type of paper and/or perforation varieties. And a few "SPECIMEN" stamps exist on paper and/or perforation varieties that are unknown on regularly issued stamps! In the beginning, SPECIMEN stamps were limited to 1,000 copies only of each issue. From the 1978 Quezon Centenary up to the 1984 Paredes issues, half of all locally printed SPECIMEN stamps were sent to Southern Stamp Service. The other 500 sets were distributed by the Philippine Stamp and Philatelic Section. There are exceptions to the quantities available of these SPECIMEN stamps because, except for the 1978 Philippine Long Distance Telephone Company (PLDT) se-tenant pair, 1,000 stamps of each issue were overprinted regardless of how many designs there are in a sheet. Therefore, se-tenant issues became much scarcer. There are only 250 sets each of the 1981 Philippine Corals, Philippine Motor Association, Jesuits, and, the 1983 National Science and Technology se-tenant blocks of four. There are only 200 sets of the 1983 Christmas and Philatelic Wee se-tenant strips of five. Two issues of 1979 are very scarce: The Carlos P. Romulo and Philippine Birds. Somehow, only 78 sets of the Romulo stamps were received from the printer making it the scarcest SPECIMEN set locally. Because of this, forgeries are now known to exist. As to the 1979 Philippine Birds issue, the printing was done in London. The 500 sets of SPECIMEN stamps intended for the Philippines was lost in transit. The other 500 sets were retained by Southern Stamp Service. The Bureau of Posts was unable to distribute to their regular distribution list, thus, those who want to complete their collection have to search for them abroad. There were no SPECIMEN copies for Overprinted stamps, Reissues and Souvenir Sheets of locally printed stamps. Also, a few issues that were released during this period were missed. For issues printed abroad, the Bureau received 500 sets of each, except for the Espana '84 and 1984 Los Angeles Olympic issues. For the Espana '84 issue, none were officially printed, although Southern Stamp Service prepared some for both of the stamps and souvenir sheets, perforated and imperforate copies. For the 1984 Los Angeles Olympics, the Bureau received 120 sets of the stamps and 99 copies of the souvenir sheets. For the 1981 Pope John Paul II Visit, although the Bureau received 500 sets of stamps and souvenir sheets, almost all of them were given to government and Papal officials as well as to VIP guests during the Pope’s visit. Starting with the 1984 "KKK with red background" issue, up to the last SPECIMEN sets of 1989, the quantity became 1,000 sets for stamps and souvenir sheets. For all locally-printed stamps, Southern Stamp Service received only 50 instead of 500 sets. For stamps printed abroad, the Bureau continued to receive 500 sets out of the 1,000 printed. By 1990, the quantity of SPECIMEN stamps issued varied from time to time. For the first three issues there were only two sheets of 50 each, and there were only two of the 1991 USAFFE souvenir sheets. Starting with the 1991 St. John of the Cross issue up to the last of the 1992 issues, there were 500 SPECIMEN stamps for each issue, regardless of the number of designs in each sheet, with some exceptions. The USAFFE mini-stamps and the 1992 Mt. Pinatubo Fund issues have only two sheets of 200 each. The 1991 Flower mini-stamps have five sheets of 200 each and the 1992 Great Filipinos have only one sheet of 200. In 1991, only five SPECIMEN souvenir sheets were issued. This was increased to 50 for issues of 1992. Starting 1993, the quantities were further increased to 1,000 pieces of each issue and 200 of each souvenir sheet. This continued up to the 1994 Filipino­-Chinese Chamber of Commerce issue. The printer was still delivering 1,000 pieces of each issue, so se-tenant issues continued to be much scarcer. This problem was rectified starting with the 1994 "Congratulations" issue. Since then, all new issues have 500 sets of SPECIMEN stamps and 200 souvenir sheets. SPECIMEN stamps should have been overprinted on the initial printing of all issues, if the Bureau intends to release them ahead of or on the date-of-issue of the stamps. However, before the 1990s, they were overprinted and delivered to the Post Office during the last stages of printing, or together with the last delivery of the stamps. Therefore, many of the SPECIMEN stamps exist with paper and/or perforation varieties. This is because by the time the printer was ready to print the SPECIMEN stamps, the original paper type was no longer available. In fact, there are some SPECIMEN stamps that exist with more than one type of paper and/or perforations, and a few exists with paper types and/or with perforations that are not known to exist on the regularly issued stamps. From the start, the agent, Southern Stamp Service, was given half of the printed quantity of 1,000. It was supposed to handle the foreign promotion and publicity, and to distribute these to editors and publishers abroad. Therefore, the Bureau handled the local distribution to collectors and dealers. The distribution for issues between the 1978 Quezon Centenary and the 1984 Ausipex ’84 issues was done in a haphazard manner and some people were able to get a lot while others were only able to get some, occasionally. Most sets with serial numbers end up with different numbers for the stamps in the set; and many got short sets also. With the quantities of 500 sets only and with se-tenants having only 100-125 sets for local distribution, the SPECIMEN issues of this period are very elusive. Starting with the "KKK with the red background" issue, a new officer was placed in-charge of distribution, so most collectors and dealers were getting their allocation in an orderly fashion and almost everybody signed-up for them. For issues up to the 1989 Fiesta Islands I, most sets have identical serial numbers, including the souvenir sheets. There were a few exceptions though, because when a set consists of both horizontal and vertical stamps, the numbering sequence is often in a different direction. To get same corner blocks for the set, the sheets have to be broken down in such a way that identical numbers are possible. At times, the numberings for even same format stamps came with different directions in sequencing. With 950 sets to distribute (500 for foreign-printed issues) and with a more systematic and orderly manner of distribution, SPECIMEN issues of this particular period are more readily available. With issues of the 1990s, one to two sheets plus 2 to 5 souvenir sheets were always given to the Postal Museum and Philatelic Library. Therefore, the first few issues were not distributed to collectors and dealers. For those issues in sheets of 100 to 200, only a very limited quantity is left for distribution. Due to the limited quantity of the souvenir sheets, people getting blocks of 4 of the stamps are allocated with I souvenir sheet only. Starting 1993, the main objective for the printing of SPECIMEN issues is being undertaken. Over 40 editors and publishers abroad are in the mailing list for these SPECIMEN stamps. As a result, we now see Philippine new issues listed in many philatelic magazines and journals. Due to the limited quantity and more equitable distribution, SPECIMEN issues of the 1990s are seldom found on the market nowadays, especially the souvenir sheets, since most are already in collections.